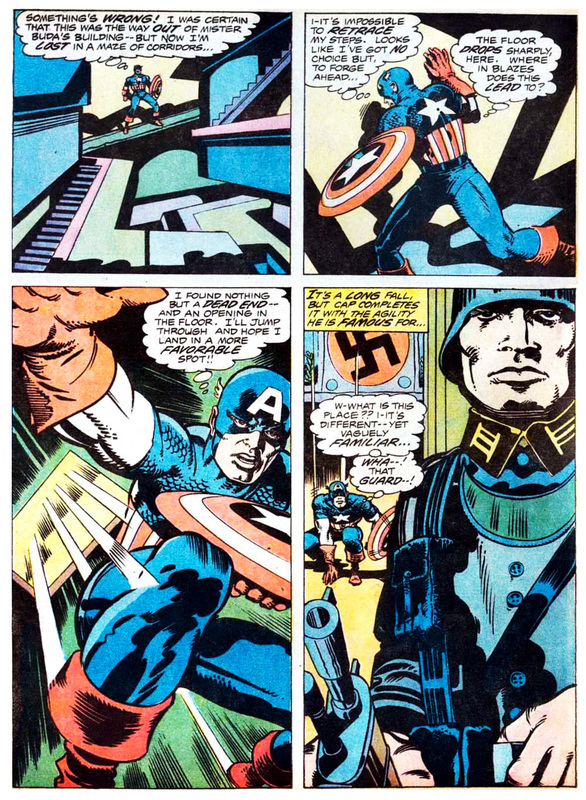 Marvel Treasury Special: Captain America’s Bicentennial Battles (1976) | 'TAIN'T THE MEAT… IT'S THE HUMANITY! 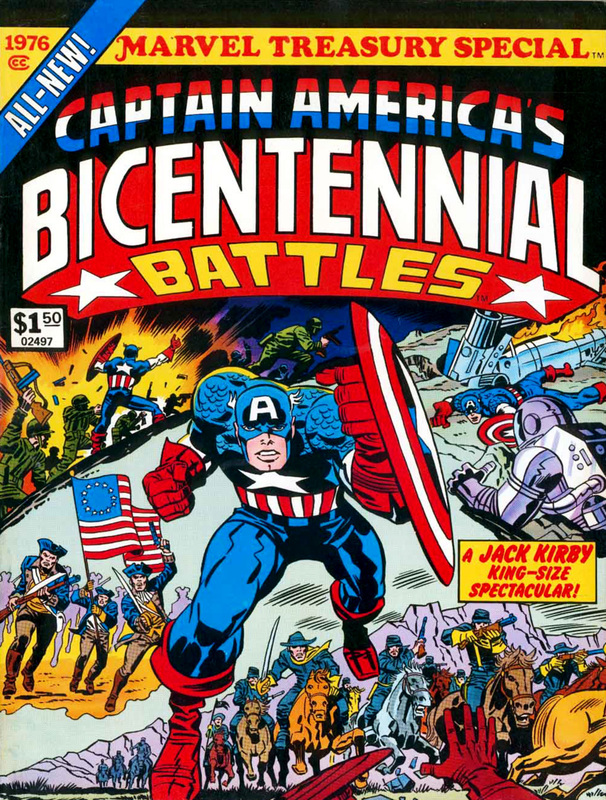 Published by Marvel Comics in 1976 to coincide with the 200th anniversary of America’s independence Captain America’s Bicentennial Battles was released under the Marvel Treasury Special banner. 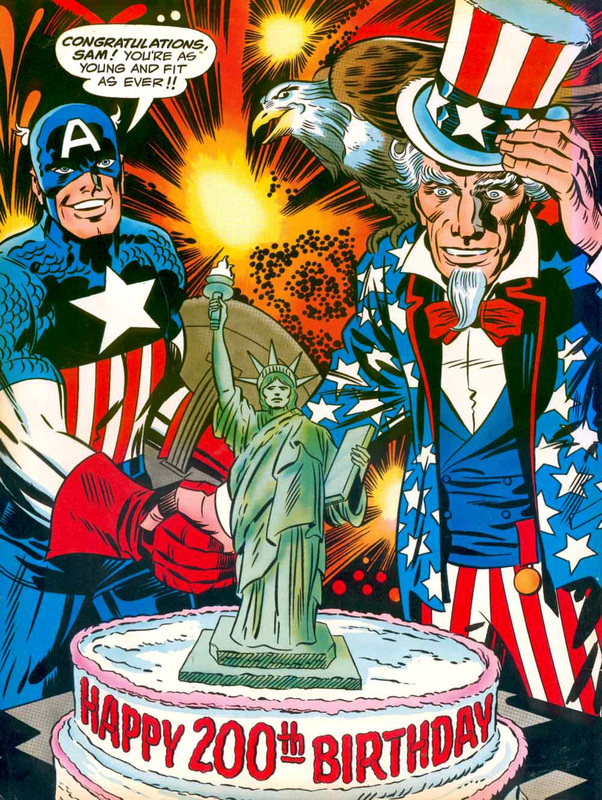 The red, white and blue spangled superhero was the natural choice to lead Marvel’s independence celebrations and who better to oversee the story than the man who not only created the character but also helped reinvigorate the genre of superhero comics: Jack Kirby. In keeping with Marvel’s other Treasury Editions Captain America’s Bicentennial Battles ran to 84 full-colour pages (the inside covers were black and white), was priced at $1.50 (50p in the UK) and sized at a generous 10 x 13.5 inches. But unlike other Treasury Editions, which contained reprinted classic material from Marvel Comics’ back catalogue, this book featured new content created specifically for this collection. 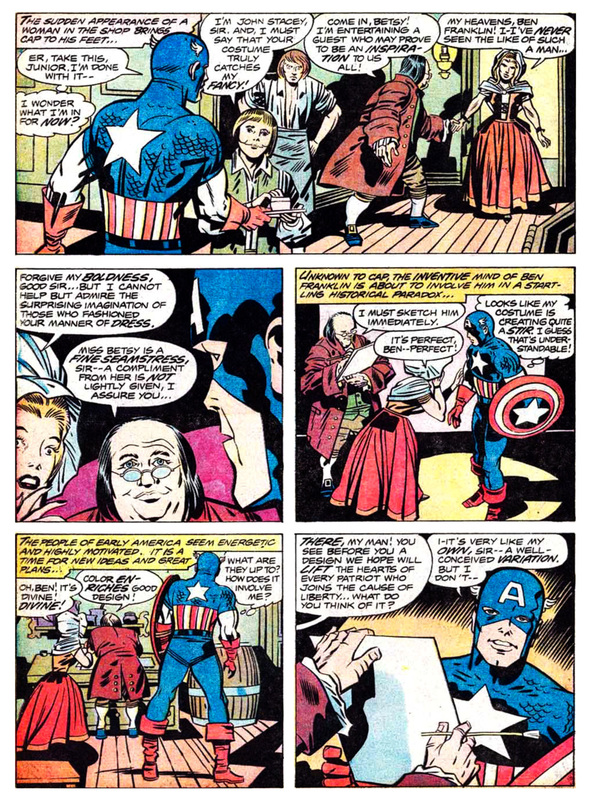 The story begins with Captain America accepting an invitation from a mysterious eastern mystic – the wonderfully named Mister Buda – who sends Cap bouncing through time and space revisiting key events from America’s history in search of the true meaning of being ‘American’. On his journey Cap rubs shoulders with several famous Americans and relives events of historic significance: he meets Benjamin Franklin, who is so impressed by Cap’s uniform he uses it as the basis for the American flag; he helps Geronimo defend against the US Cavalry; witnesses the great fire of Chicago and saves a freed slave from a lynch mob. He also takes part in a Busby Berkeley-inspired Hollywood musical, witnesses an Atomic-bomb test and visits the Moon! 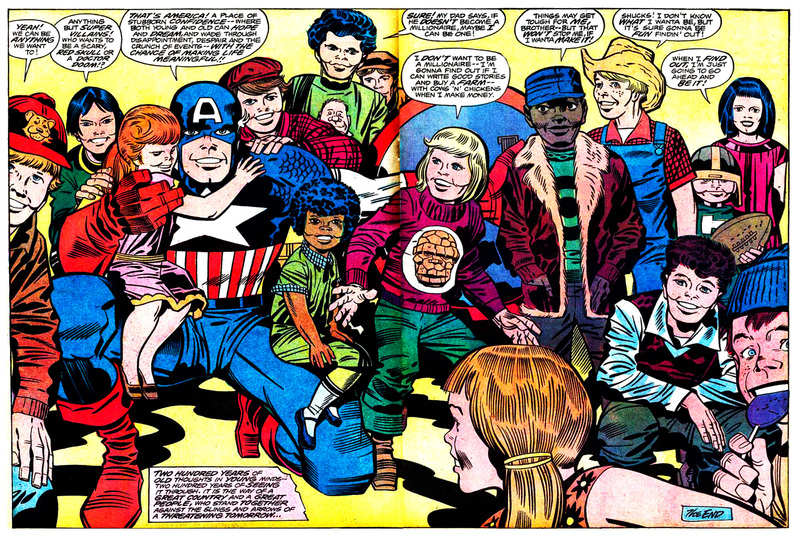 The story ends with Cap realising that the desire to succeed against all odds is the true essence of the American spirit – that and kids are the future. Kirby wrote and pencilled the story (with inking by Herb Trimpe, John Romita and Barry Smith) and on the whole it succeeds very well. Kirby’s work for both Marvel and DC in the early to mid-1970’s tended to be a little incoherent, with the scale of his tales frequently overpowering his actual storytelling abilities. (I should point out that I’m a great fan of Kirby’s work from this period. To my mind his artwork was never better and I enjoy the operatic grandeur of his stories – who cares if they didn’t actually make much sense.) Luckily he holds it together for this collection which, despite the fragmented quality of the story, is terrifically entertaining. 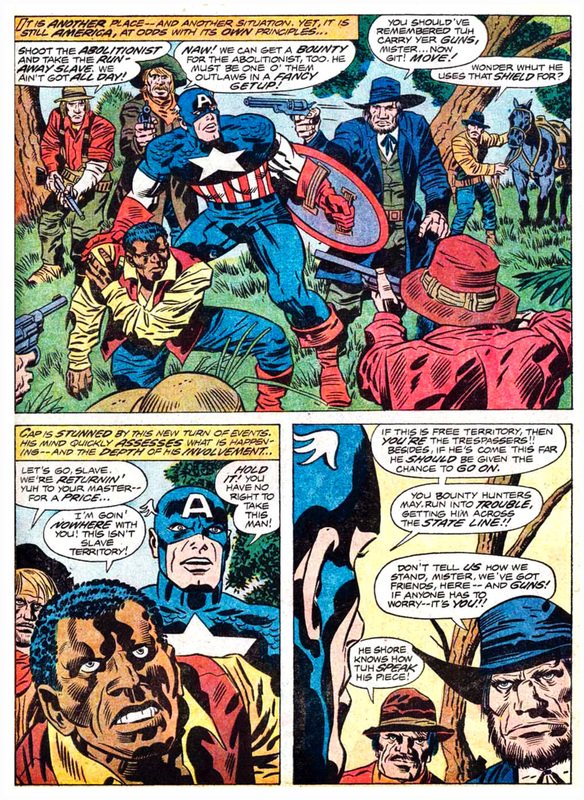 And to his credit Kirby doesn’t shy away from highlighting some of the more controversial elements of American history, such as the use of slaves and the poor treatment of native Americans. There are some nice flourishes too: using Cap’s uniform as the inspiration for the design of the American flag for example, and showing him as an influence on anti-slave campaigner John Brown. 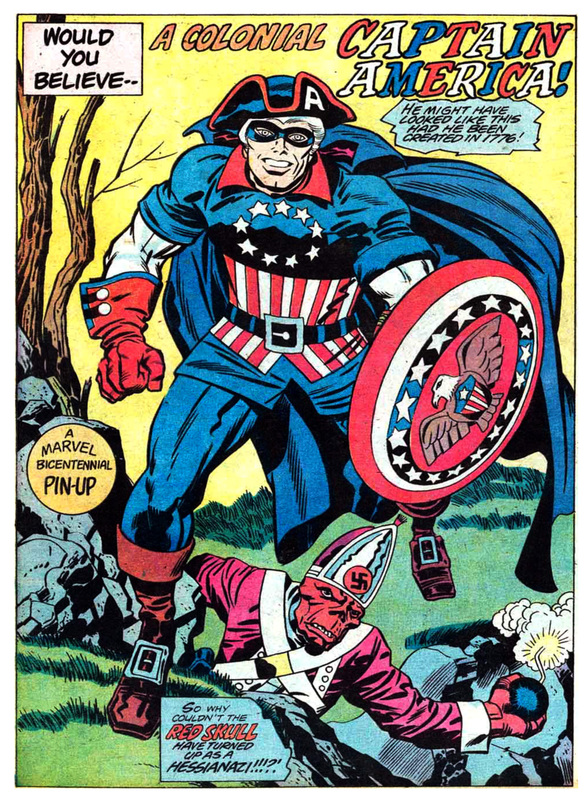 The collection is rounded off with three full-page pin-ups showing how Cap may have looked at different periods in time as well as a tribute to the man behind the mask, Steve Rogers, on the inside back cover. Not surprisingly Kirby’s artwork is top-notch and he pulled out all the stops visually, infusing the artwork with his usual blend of power and graphic strength. Both Trimpe and Romita did a good job inking Kirby, with both helping to bring out his distinctive drawing style. The only weak spot is Barry Smith’s inking of the opening segment; although a talented artist in his own right Smith’s style is too fine and delicate to really do Kirby justice. Although Marvel would go on to publish dozens of reprints under their various Treasury banners Captain America’s Bicentennial Battles was the second, and last, Treasury Special Edition to be released, the other being the Giant Superhero Holiday Grab-Bag from 1974. Jack Kirby’s work from this period would feature in one more dedicated Treasury Special: 2001: A Space Odyssey. I’ll be taking a closer look at that soon.